UNITED NATIONS, September 7 -- With the UN's and Ian Martin's plan to send military observers to Libya having been shot down by the National Transitional Council, as a fallback the UN wants to focus on prisons and the training of police. Well-placed Security Council sources told Inner City Press on September 7 that the United Kingdom is drafting a resolution to create a UN Libya mission, and that the UK is "waiting to hear back from Ian Martin" on its contours. The UK shouldn't have much trouble reaching Ian "the Brit" Martin. Meanwhile despite some loud unfreezings of Libyan assets, sources say that it is not smooth sailing for the other pending unfreezing requests. "The money wouldn't go to the Libyan people," a dubious Security Council diplomat told Inner City Press on Wednesday morning. "It would go to the Contact Group" -- since renamed the Group of Friends of Libya -- "that is, to some nations claiming to act on behalf of the Libyan people." 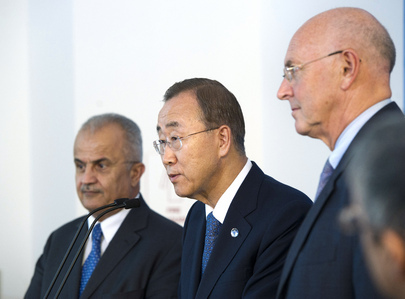 Secretary General Ban Ki-moon's moonlighting mediator Al Khatib appears entirely off the scene. Even as the NTC negotiated with those in Bani Walid, Al Khatib was nowhere to be seen. "It's over for Khatib," a well placed Permanent Representative told Inner City Press on Tuesday night. "Ian Martin has won. But what has he won?" Inner City Press: what’s the role now of this, Mr. Al-Khatib, as mediator? I mean, there is this stand-off between the, the NTC and the Qadhafi supporters in Bani Walid which seems to call out for some kind of mediation; is he totally out of the game now? When is the last time he went to Libya? What is his continuing role with the UN as a mediator between these two parties? Deputy Spokesperson del Buey: He continues in his role as he had been appointed to, and it is a question now of the hostilities coming to a cessation and the transition over to the post Qadhafi era in Libya, where Ian Martin’s group will take over and do the work with the Transitional Council to implement the changes that are going to take place in Libya. Inner City Press: did the UN ask the NTC if they had any desire for this kind of mediation, they have been obviously speaking to, to Qadhafi supporters and tribes there, but it seems to be a kind of a mediat-able (sic), you know, mediation situation. Is there no role for Mr. Al-Khatib in that? Deputy Spokesperson: Well, I’ll have to find out and get back to you on that.